Q&A: Using of digital multimedia art through the application of imagination? Dealing with an overwhelming amount of imagination. Expanding her imagination-based contact with her hybrid daughter being raised in an ET civilization? What is her life like with this hybrid civilization? Since everything that is observed changes when observed, does a person's experience in life change when observed by someone else? Changing negative perceptions of other people? How can the questioner opening the potential in her relationship with a Spinner dolphin in Hawaii and with music. Reducing the turmoil in emotional decision making. 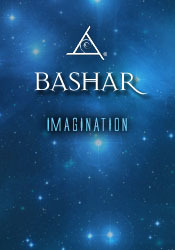 Is Bashar's civilization at the point of instant manifestation, or is there a delay in manifestation like on Earth? Expanding your efforts to help other people. Understanding her spirit guides.How does a crippling knee injury reflect his fear of taking his next step?Are all imagined realities just as physical to the inhabitants of those realities as our reality is to us?